The party scenes in Thailand will go back into life on 14 November, after a month-long suspension for mourning the loss of people’s beloved King Bhumibol Adulyadej. The death of the 88-year-old monarch on 13 October this year thrust the nation into a sudden grief. After the death announcement, the Royal Government of Thailand imposed restrictions on all recreation activities including musicals, theaters, concerts and sporting events. Soap operas were asked to go off the air, fairs and festivals were postponed as well. Even though there were no limits to tourism, the visitors were still overwhelmed by the repressive mourning atmosphere hung over the kingdom. According to Thailand’s Prime Minister Prayuth Chan-ocha, the normal entertainments of everyday life can resume on 14 November with TV channels airing soap operas again and celebrations taking place on schedule. The golden twilight veils the imposing Wat Arun Temple in Bangkok, Thailand. The upcoming festival is the Loi Krathong Festival held on 14 November, which is universally recognized as the most charming one of all Thai festivals. Christmas celebrations, New Year countdowns, as well as Chinese New Year, will go ahead as planned. The visitors can feel assured to go to Thailand and enjoy the passion and hospitality of this country. However, the authority still recommends visitors to wear plain-colored clothes to show reverence to the late King and avoid any disrespectable and inappropriate behavior. 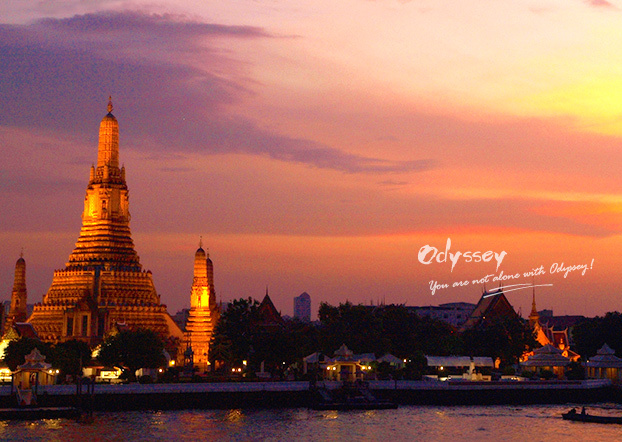 At present, Odyssey Tours has developed itineraries covering Thailand’s tourism attractions in wide varieties from classic sightseeing to remote exploration. If you have been longing for this exotic kingdom for a long time, it is time to let us customize your private tours now!